New anti-fatigue and safety mats are being released by the General Mat Company to help employers find a cost-efficient way meet occupational health and safety obligations in wet and dry areas of workplaces. GMC Workmate No 824 features a combination of large holes for superior drainage and 12mm-thick soft rubber construction for enhanced comfort in applications such as industrial workstations, maintenance benches and food preparation and service areas. 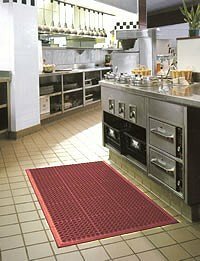 The multi-purpose mat - with wide borders and bevelled edges for safety and stability – complements GMC’s 24/7™ 570-With Holes and 24/7™572-Solid Top matting systems, which provide a modular safety and anti-fatigue solution for both wet and greasy areas. The 24/7 modular designs plug together via a hidden interlocking system, to fit neatly into spaces of different shapes (around corners, behind counters, underneath workstations and in odd-shaped production areas, for example). GMC Workmate No 824, meanwhile, is a stand-alone product that can be used singly or in multiples. Available in black (Grease Resistant) or terracotta (Grease Proof), it comes in stock units of 900 x 1500mm which GMC Managing Director Mike Siegle says provides an entry-level quality solution to addressing safety issues arising more frequently in the workplace as Australia’s workforce ages. “Many employers to date haven’t been interested in safety underfoot until someone falls over. But now the issues of slip and fall accidents and worker fatigue are becoming too big to ignore,” said Mr Siegle, who is introducing new ranges of economically priced safety and anti-fatigue matting to attract employers who previously believed they could not afford comprehensive safety underfoot. “Employers today are much more interested in prevention rather than cure, particularly when they see the steep rise in litigation and settlement costs relating to employers who have not taken steps to address issues continuously being raised by employee advocates and governments. But while there is a far greater willingness to address such issues today, employers are still very concerned to make every dollar count in terms of value and quality,” said Mr Siegle. To reinforce its quality credentials, GMC Workmate was recently subjected to CSIRO’s tests for Slip Resistance Classification on New Pedestrian Surfaces. It was one of six GMC mats tested by the CSIRO, all of which easily passed the tests conducted on wet and dry surfaces to AS/NZS 4585:1999.